So what’s your encore after the greatest season in school history? Simple, build a beautiful picturesque stadium on the banks of the Brazos and return the best quarterback in the conference. Oh and a coach who don’t care about what’s going on in Austin, College Station, Norman, Lubbock, Tuscaloosa, Washington DC, Tehran, or the Hague. How do you spend your spring? Doing two things, oiling the machine and bringing in more tools to clobber guys with. Remember when Lache Seastrunk was going to win the Heisman, be first round pick, kick the hell out of Jim Brown and develop an alternative energy source equal or greater to that of corn? Well he wasn’t bad, when you average 7.4 yards a carry you are beyond useful. Glasco Martin was the thunder to Seastrunk’s lightening. Pitching in over 500 yards in a season that was limited by injury. Both are gone. See you at the crossroads. Enter Shock Linwood. I never even considered naming any of my children Shock and they are now forced to live with the burden of that omission. Linwood contributed over 800 yards and almost 7 yards a carry as a freshman. Devin Chafin filled in at times, averaging almost 6 yards a carry. Want another offensive weapon out of the backfield? That’s kind of like asking whether we need another Kardashian sister. Try out Johnny Jefferson anyway. He’s combination of speed and size who may be the best at the bunch catching out of the backfield. What about the back end? Ahmad Dixon has taken his talents to Big D. The McClennan County Sheriff’s Department for one is pleased to see him go. Dixon and three others starters depart the five man BU secondary. So, what about the secondary, safety in particular. Orion Singleton and Terrell Burt appear to be up for the task. Singleton filled in for Dixon and Burt is a experienced hand. 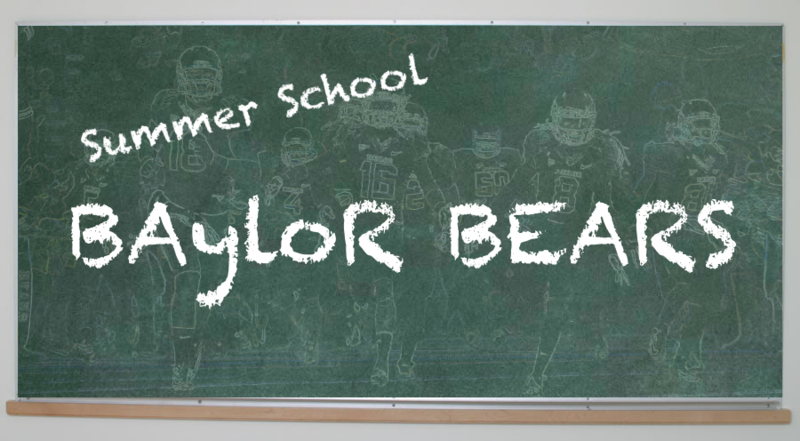 While we’re at it, the frightening thing about Baylor moving forward may be this: they just keep coming. Seastrunk and Martin went down and Shock Linwood looked every bit the part. Dixon went down and Stewart flew around like he owned the place. Say this about Briles, he has convinced every player on the roster that they belong on the field against all comers. The Bears also lost Sam Hull, a swiss army knife at safety and full predator K.J. Morton. Terrence Singleton moves in at corner, making the switch from safety and a pair of JC transfers, Tion Wright and Chris Sanders will need to contribute in a hurry at the other corner. The website Our Daily Bears, like most fan websites, is all in all the time on the Bears. They have taken in the green Kool-aid, intraveneosly, and have the Bears winning the Big 12, the National Title, the World Cup, and the Super Bowl. Baylor loses two very good offensive lineman from last years roster, including physical brute Cyril Richardson and a very good tight end in Jordan Najvar. The Bears left tackle, Spencer Drango was lost late last season with a knee injury. Still, optimism runs high on fan websites and Our Daily Bears is bullish on the Bear offensive line, claiming they may be the best in the Big 12. A lot of that depends on some big if’s. This may be the best offensive line in the Big 12 or at least one of the better ones if Drango comes back at 100%, if new center Kyle Fuller settles in, if mammoth (and we mean MAMMOTH) guard LaQuan McGowan can hold down Richardson’s spot and you know...move from place to place. And if the Bears can find a tight end that can make life generally easier a la Najvar. That guy is Shawn Oakman, the 6-9 270 pound defensive end. Now Art Briles is convinced that since none of his guys could block him in the spring, then no one will be able to block him in the fall. I like it Art! Now apparently last fall other squads didn’t have great difficulty blocking him, Oakman registered 2 sacks. You’re 6-9 big fella, use those arms and get loose! Against better tackles Oakman was neutralized, however there could be big things in store for our guy seeing as how 2013 was his first action in almost 2 years. If he can be a two player occupier then a young talented defensive line will have even more ability to dictate the game. If however, Oakman is just a physical freak on the hotel lobby team then Baylor will need to find another way to pressure the quarterback. Post Season on the line. Posted on July 1, 2014 by Sure Bud and filed under Southwest Round-Up and tagged Southwest Round-Up 2014 Spring Review Baylor New Baylor Stadium Summer School Sean Oakman.